A reliable stove enhances life on the trail. With nice, hot meals to look forward to after long days of hiking, trekking or climbing and a steaming mug of coffee to wake up to before the following day’s adventures, you will enjoy the outdoors more and you will be able to adventure longer. Luckily, you don’t have to lug around bulky stove tops or heavy fuel canisters. The best backpacking stoves are lightweight and pack down so small they aren’t a burden to carry on your back no matter where the trail leads you. Below are some of the best backpacking stoves on the market. They are the top favorites among backpackers due to their lightweight convenience, ease of use, reliability, and durability. They range from ultralight canister and solid fuel stoves to integrated boiling systems. Whether you want the ability to boil water fast or plan to prepare hearty gourmet meals in the wilderness, there is something to match your needs. For information on what to consider when choosing a backpacking stove, check out our buying guide below the reviews. 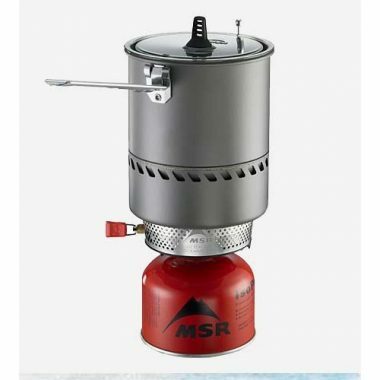 Any outdoor fan looking for a great cooking stove knows they can't go wrong with the MSR Pocket Rocket. It is such an iconic and top rated lightweight backpacking stove. This Rocket 2 is even better. It offers the ease of use, fast boil speed, and durability of the original but is more compact, lighter and features serrated pot-seats that accommodate a variety of pots. Setting it up and operating it is easy. There is no priming or pumping required. However, it doesn't have a built-in starter and you have to bring along matches or a lighter. It burns extremely hot and efficiently due to the WindClip wind protection. It is a versatile stove that performs excellently at both boiling water and preparing epic meals. Its fast boiling performance is well known- it boils one liter of water in just 3.5 minutes. The flame adjusts fully from a simmer to a full rocket roar. Very lightweight and compact, the Rocket 2 suits minimalist backpackers and travelers. It doesn't take too much space or add weight to a backpack or carry-on luggage. It is fueled by isobutane-propane fuel canisters that are easily available. The durability of MSR Pocket Rocket stoves is legendary and this is a solid stove that will accompany you on countless adventures. This is one of the lightest and most portable backpacking stoves on the market. You will be amazed by how small and easy to carry it is. This combined with its low price makes it excellent for beginner and ultralight backpackers, youth scouts, and travelers on a budget. 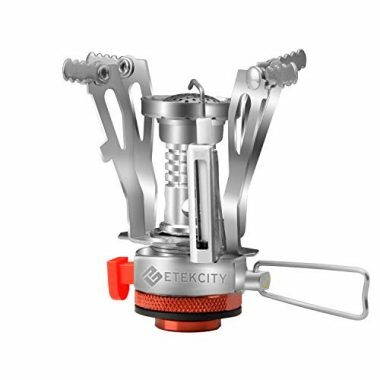 This Etekcity ultralight backpack stove packs a lot of cooking power in a small package. The onboard piezo igniter makes lighting it up easy. It puts out a whopping 6,600 BTU's of heat and a very hot concentrated flame. Whether you mostly boil water or love to make elaborate meals in the wilderness, you can adjust the flame to your desired intensity. The valve connection ensures that the flame stays consistent. It is also fuel efficient and performs well even in below freezing temperatures and high altitudes. Even though this is a little stove, stability is not an issue. 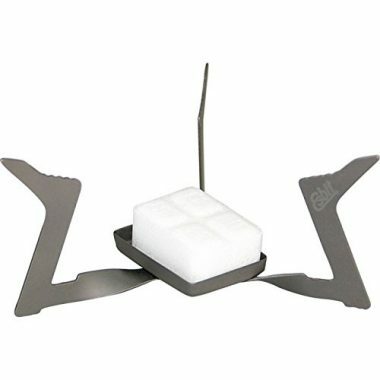 Four-angle solid support keeps the stove firmly on the ground. Serrated holders and pot legs that flip outwards make fixation of pots and pans easy. This compact stove holds small to medium pots - up to 7"(18cm) diameter pot. Traveling with the Etekcity stove wherever your adventures take you is easy. It folds into a palm-size package and works with any standard 7/16 thread single butane/butane-propane mixed fuel canisters, which means that fuel is readily available. 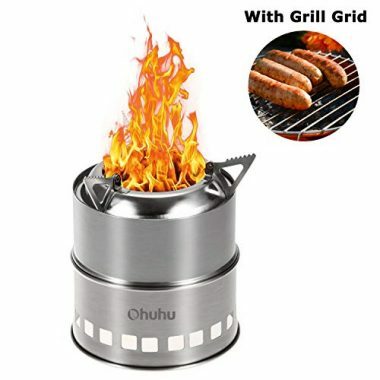 Even at the low price, aluminum alloy and stainless steel construction make this a sturdy stove that can handle intense heat and outdoor elements and last. Want to pack light and travel fast but still need a way to boil water for coffee and meals? The Esbit pocket stove is such a brilliant concept and the best ultralight backpack stove. It folds into a pocket-size package just larger than a deck of cards. It is perfect for solo hikers, short weekend trips, mountaineering, or as a backup camping stove. The Esbit pocket stove is a small, fold-open metal case that burns solid fuel pellets. It comes with 6 Esbit 14 g solid fuel tablets that have a shelf life of 10+ years, as long as they are kept dry. Lighting it up is easy. Just place one or two fuel tablets in the center of the tray and light with a match or lighter. The fuel tablets work even at high altitudes and sub-zero temperatures. One fuel tab is supposed to burn about 12 minutes and boil 500 ml of water in about 8 minutes. You can use canteen cups, pots or pans. To bring the water to a rolling boil in this time, you may want to burn two tablets. Two sides are shielded from the wind and you can improve its efficiency by positioning the two open sides away from direct wind or adding a windscreen. This is a robust stove made using a strong and thick electrolytic galvanized steel that resists corrosion. It is built to take beatings and last years. With this inexpensive and lightweight backpacking wood stove by Ohuhu, you don't have to spend money on or lug around fuel canisters or bottles when hiking or backpacking. You will love the ritual of it and the smell of campfire it instills in your drinks, meals, and campsite. It utilizes just about anything flammable - dry twigs, leaves, kindling, pine cones, and wood. You won't have a problem finding fuel for it in most locations. When it is wet and chilly, you can burn solidified alcohol tablets. It is easy to set up, burns really hot and fuel lasts a long time. It brings water to a rolling boil fast and cooks meals quickly. Crafted using high-quality stainless steel, this portable camping stove is sturdy and can handle high heat and the weight of pots. It has a 3-arm base support system that keeps it stable on the ground while ensuring even heat distribution. When you're done, this collapsible wood burning backpacking stove is easy to take down, clean and pack in its mesh bag. The only drawback to using this stove is that your pans will get soot. 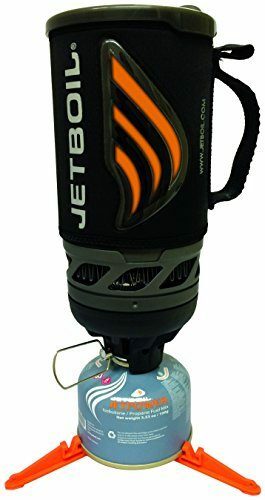 If your outdoor cooking when backpacking mainly revolves around boiling water, the Jetboil Flash cooking system is the best backpacking stove for boiling water for coffee, soups, noodles, pasta, or gourmet freeze-dried meals. It is a lightweight and compact all-in-one system. Everything including the fuel tank fits perfectly inside the Jetboil cup and takes very little space in a pack. It is excellent for backpacking, hiking, motorcycle camping trips, and even car camping trips. The best thing about this integrated canister stove is its boiling speed and efficiency. Its efficient igniter design complete with a built-in windscreen captures and focuses heat efficiently. This system boils two cups of water in only two minutes. It combines an adjustable stainless-steel burner and a 1-liter insulated and hand-anodized aluminum Jetboil cooking cup. You only need to add water or liquid to the cooking cup and fix it to the burner. You can also use it with other Jetboil cups, pots, and accessories. It will also fit the coffee press that comes from Jetboil so you can use it as a french press for making delicious coffee. If you have a pot support, you can cook with any pot. It runs on 100-gram Jetpower fuel canisters. Each canister has the capacity to boil 12 liters or 100 cups of water. Safety is ensured by the cooking cup that locks securely onto the burner and the fuel canister tripod that keeps the entire unit stable. An electric igniter and easy to adjust fuel valve makes lighting the burner easy. The convenient color-changing heat indicator lets you know when your water is ready. The JetBoil Flash is built of high-quality materials to take a beating and last. It also features a drink-through lid and a neoprene insulating lining within the cup. The protective plastic bottom of the cup is removable and can serve as a small bowl or measuring device. 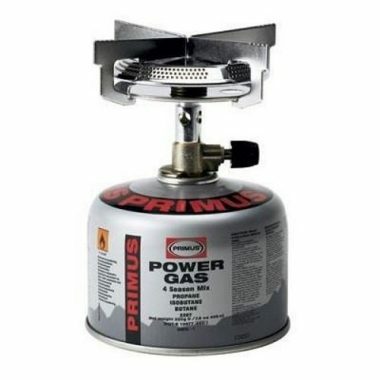 Whether you want simple boiled meals or the ability to prepare gourmet meals on the trail, this Primus Classic trail stove will serve you well. Small, lightweight and portable, it is the perfect companion on the trail whether you're backpacking, hiking, or motorcycle camping. Using this stove outdoors is a joy. It easily screws into a can of fuel and it works with all kinds of canisters. It puts out a very hot flame and brings water to a boil very quickly. The crosswise pot support is excellently wind resistant. The knob allows for fine tuning of the heat from very low to simmer things to roaring high to boil things out. As typical backpacking stoves go, this stove is a little on the large and heavy side. This is because it is made very solid to last. It is also very stable and the wide burner accommodates larger pots and pans when cooking for up to three people. Packing and carrying it is easy as it is composed of two parts - the burner top and the valve assembly. These parts fold down small and fit in their own mesh bag without taking a lot of room in a pack. If you want the best lightweight backpacking stove that won't add too much weight to your pack or take too much space in it, you can't go wrong with this little and ultralight backpack stove by DragonPad. With its extremely small and ultralight form, this is every minimalist backpacker's dream stove. You will be amazed by just how small this stove is and may be skeptical about its performance before you've had a chance to put it to the test. Once you get to use it, you will find that it works amazingly well and is as reliable as more expensive stoves. It utilizes isobutane/propane fuel canisters and will fit on a wide variety of canisters. The piezo ignition works well and the stove lights up quickly. It puts out a very good flame that adjusts from a torch level to flickering. Boiling water for rehydrating food and making hot drinks is a matter of minutes and you can use it to even cook stir-fried meals. When folded it fits into its box and is about the size of a box of cards. The only downside to its compactness and weight is that it can be quite unstable. You can bring along a tripod to help stabilize it. A simply designed folding stove constructed from ultralight titanium, this Esbit solid fuel stove is the best lightweight backpacking stove for minimalist and ultralight backpackers and solo hikers. It is a great way to minimize pack weight and bulk without losing the ability to boil water and enjoy hot meals and beverages. This stove is very sturdy and stable. Having three legs makes it easy to level out on the ground. The stove legs are designed in such a way that various sizes of cups and pots will fit comfortably. 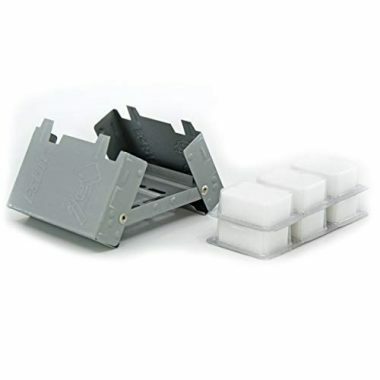 The tablet tray holds a 14g Esbit solid fuel tablet in place. One fuel tablet will boil two cups of water. You will need to buy the Esbit cubes separately. The fuel is capable of extremely good low temperature and high attitude performance but you will definitely need a windscreen for maximum efficiency. At 0.4 oz., you won't feel like you're carrying a stove. It folds into an ultra-compact package that fits in the included mesh bag for space efficiency. If your outdoor meals are more complex, you will need a different stove such as the MSR Dragonfly reviewed next. When it comes to all-purpose versatility and reliability, the MSR DragonFly is unbeatable. It is stable, multi-fuel and suits a wide range of meals, group sizes and outdoor conditions. It is a solid workhorse that does it all - simmer, boil, bake, fry, and grill in the rain, snow, and wind. This is a top favorite backpacking cook stove for backpackers, campers, mountain guides, and outdoor chefs. It is fantastic for group backpacking, alpine hiking, winter hiking, extended backcountry trips, and backpacking abroad in remote locations. The temperature control on this stove is excellent. The flame is slightly on the loud side when on full blast but it can be fine tuned very well. 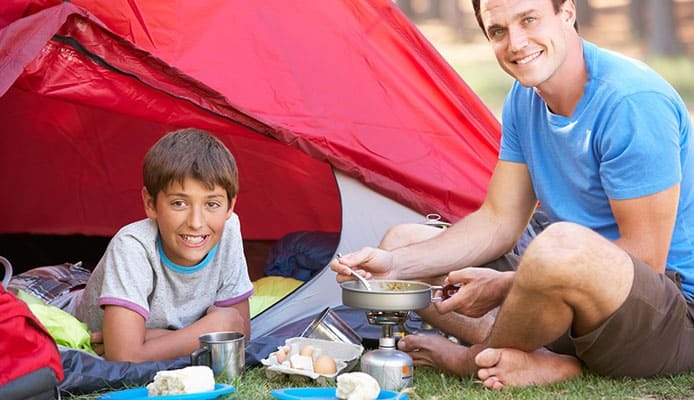 The easy to use simmer function makes it possible to cook a variety of gourmet dishes while camping. It goes from simmer to roaring at the twist of a knob for boiling water and melting snow in a few minutes. It burns multiple fuels including white gas, unleaded gas, kerosene, diesel, and jet fuel. Being a liquid fuel stove, it isn't affected by cold weather. It will light up and work just fine even in below freezing conditions where propane/butane canister stoves won't work. The suspended burner cup increases efficiency and it comes with a windscreen for even more efficiency. With extra wide pot supports, the MSR Dragonfly is stable even with larger and heavier pots on it. You will also be impressed with the overall quality of the stove. It is a long lasting outdoor stove you will use on many different expeditions. It is also lightweight and compact for its ruggedness and output. 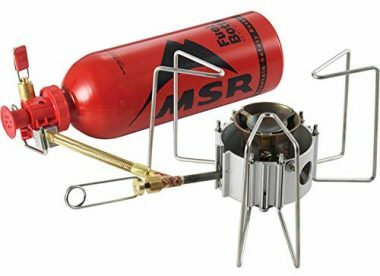 A leading manufacturer of backpacking stoves, MSR hasn't been left behind when it comes to integrated backpacking stove systems designed to boil water quickly and efficiently. In fact, MSR offers one of the fastest and most fuel efficient stove systems with this neat and compact Reactor system. This is a full-throttle boiler that brings 0.5 liters of water into a rolling boil in just 1.5 minutes. The completely enclosed radiant burner, heat exchanger and internal pressure regulator produce superior fuel efficiency and outstanding boil time. This top rated lightweight backpacking stove performs well even in windy conditions, cold environments and high attitudes. When camping in freezing temps, make sure to keep your fuel container warm in your clothes or sleeping bag. Transport isn't a problem as the Reactor system is a lightweight and compact system where the stove and fuel fit inside the pot. And with MSR’s proven quality and durability, you will enjoy value for your money for years to come. As a backpacker, you want a lightweight and compact stove you can fit in your backpacking pack. It should also be easy to use and reliable in the great outdoors. The above are some of the best backpacking stoves on the market. Now let’s go through the factors to consider when evaluating your options so you can boil down to the right stove type and model for you. The right stove for you will depend on a number of factors such as the preferred and available fuel type, your trip destination and duration, the conditions you will be cooking in, the type of meals you will be making and whether they require boiling or simmering, and your personal preferences. Backpack space is precious and the ideal backpacking stove would be compact and packable not bulky or awkward to pack and carry. Backpacking stoves come in all kind of sizes. There are ultracompact models that collapse into a fist size packages and there are larger models that can cook for multiple people. Stoves with foldable and nesting designs take up very little space in a pack. The ideal size will also depend on whether you’re going on a solo expedition or adventuring as a group. If you’re a solo hiker or embarking on a weekend backpacking trip, a compact and ultralight canister stove will serve you well. For group excursions, everyone can carry their own stove or you may need a liquid fuel stove that can accommodate larger pots and pans. Don’t forget to take into account the fuel container when evaluating packability and portability. A canister option is good for short trips where one canister will be sufficient. For longer expeditions, a liquid fuel stove and fuel bottle will be more compact and better than lugging multiple canisters. There are different types of backpacking stoves based on the type of fuel they utilize. What type of stove will suit you best will depend on how many people you will be cooking for, the duration of your trip, the weather/climate conditions in your destination, what fuel is readily available and what kind of fires are allowed where you’re going, the type of meals you will be making, and your personal preference. Most backpackers carry canister stoves that utilize pressurized isobutane and propane gases, as they are lightweight, compact, stable, and durable. They are easy to use in the great outdoors – no pumping or priming is required. The ability to control the flame means you can use them to prepare elaborate meals and they are also good at boiling water. 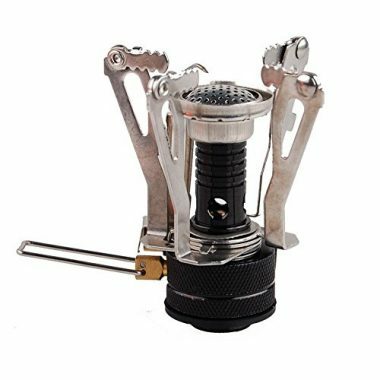 A canister butane/propane backpacking stove suits solo backpackers, ultralight backpackers, and short expeditions. The downside is that this fuel type can be hard to find in remote locations or internationally and you have to lug around empty fuel canisters. Unless they have a built-in pressure regulator, they don’t work well in extreme conditions. These are all in one backpacking stove systems that include a cooking pot, a lid, and even a windscreen. Their main purpose is to boil water fast and efficiently but some can accommodate other pots and accessories such as camping coffee makers. They are heavier, have a tall profile and are less stable than standard canister stoves. Liquid fuel stoves connect to refillable fuel bottles. Most of them run on white gas. Some also burn gasoline, kerosene, diesel, and petrol, which are readily available even in remote locations. This versatility makes them ideal for remote locations and backpacking abroad. They perform well in below-freezing temperatures and high elevations. Their low profile means greater stability on uneven ground and they can accommodate larger pans and pots when cooking for a group. They boil water very quickly but simmering ability depends on the model. One refillable bottle of fuel lasts longer than a canister of fuel making liquid fuel stoves the best for longer expeditions. Their downsides are that they tend to be heavier, require priming and maintenance, produce a roaring flame, and fuel spills can happen easily. There are different types of stoves within the alternative fuel stoves classification. They include alcohol backpacking stoves, backpacking wood stoves and those that use solid fuel tablets. They are simple, affordable, and lightweight. They are good options for ultralight and thru-hikers who mainly need a stove for boiling. They’re not very fuel-efficient and are wind sensitive so they aren’t ideal for preparing DIY meals. When backpacking, every ounce counts. As with any other backpacking gear, weight is an important consideration when choosing a backpacking stove. When hiking or trekking long distances with a stove on your backpack, you want your backpacking stove and its fuel supply to be as light as possible while still fulfilling your needs. You don’t want to be lugging around a heavy stove or canisters that weigh you down. Canister stoves are the best lightweight backpacking stoves for solo adventures and short trips. Alternative fuel stoves such as single burner alcohol or fuel tablet stoves are also ultralight and great if your main purpose is to boil water. For longer and group expeditions and trips to remote locations or abroad, a liquid fuel stove that burns a variety of fuels and uses a refillable fuel bottle while heavier is better than lugging along multiple fuel canisters. Before you order a backpacking stove, it is important to check the type of fuel it utilizes and whether it is readily available and allowed in your backpacking destination. The duration of your trip will also determine the amount of fuel you’ll need and what fuel suits you best. 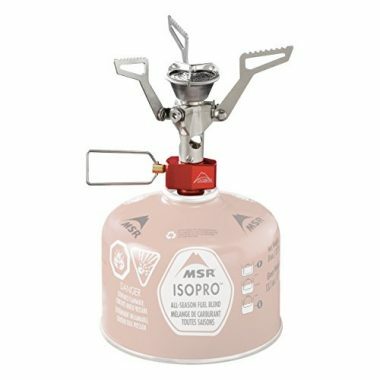 The most popular backpacking stove fuel type is isobutane-propane gas pre-pressurized in a canister. Canister butane/propane backpacking stoves are ultralight, compact, easy to use, and perform well in both boiling and simmering. However, this fuel can be hard to find in remote locations and internationally. Liquid fuel is the best fuel type for backpacking in remote locations and internationally. Liquid fuel stoves are compatible with a variety of liquid fuels such as white gas, gasoline, kerosene, diesel, and petrol. It is easy to find fuel even in remote locations. 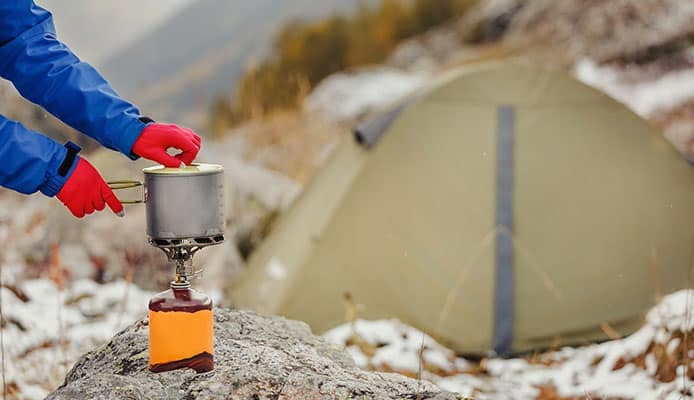 Liquid fuel stoves perform well in winter and in extremely cold places making liquid fuel ideal for when backpacking in extremely cold places and high elevations. One bottle of fuel usually lasts long making it ideal for long trips and group cooking. Some backpacking stoves utilize alternative fuels such as wood, alcohol and solid fuel tablets. They are great for ultralight and long distance backpackers even though they are less efficient in performance. When you’re really hungry and need refueling after a tiresome day of backpacking or just woke up and badly need the first cup of coffee, the last thing you want is a complicated stove. Ensure you choose a unit that’s easy to get going and that you’re comfortable using. When it comes to ease of use, canister backpacking stoves are the best. No pumping or priming is required. Just screw the gas canister into the stove and light it up. Solid fuel and alcohol backpacking stoves are also easy to use but perform poorly in windy conditions. Liquid fuel stoves require priming to preheat the fuel line, pumping of the fuel bottle to increase pressure and a little more demanding maintenance. Backpacking wood stoves are quite hard to use. You have to find dry wood and then set it up. Starting a fire can be a struggle especially if it is chilly and windy. Stability is a very important consideration when choosing a backpacking stove. Cooking when backpacking means you will be placing the stove on uneven surfaces and there is the risk of losing your meal or burning yourself. A sturdy backpacking stove that’s stable on the ground and won’t easily fall over is essential. This is especially important if you will be making more elaborated meals or cooking using bigger pots and pans. A low profile backpacking stove where the burner sits on its own fuel bottle or canister base is the best when it comes to stability. Remote canister and liquid fuel stoves are lower to the ground and have the stability required to hold large pots. High profile backpacking stoves where the burner sits over the canister tend to be lighter and more compact but less stable. Q: What Is A Backpacking Stove And Why Do I Need It? A: A backpacking stove is a compact and lightweight cooking stove designed to be used in remote locations when backpacking, scouting, biking, picnicking or anywhere a highly portable means of cooking or heating is needed. If you’re an avid backpacker who often goes away for days at a time, you need a backpacking stove if you want to eat and drink well in the great outdoors. Conditions aren’t always conducive for campfires and there are also fire bans. A backpacking stove works quickly, is reliable even in challenging conditions, and allows you to leave no trace. Having a hot meal or much-needed coffee off the grid wouldn’t be possible without a backpacking stove. If you only undertake short or no-cook backpacking trips and bring along foods and drinks that can be eaten without cooking, you can do without a backpacking stove. Q: Are Backpacking Stoves Safe? A: Yes, backpacking stoves are generally safe to use. However, there is some risk in using a backpacking stove just like with any other stove. It is important to follow some safety precautions and heed the warning label on your stove to ensure your safety and that of other people and the environment. Q: How Do I Clean My Backpacking Stove? A: A clean backpacking stove looks good, works well and lasts long in good condition. It is important to wipe it clean after every use and to give it a thorough cleaning when there is a buildup of grime. It is also important to clean it before you have to store it for a while. Before you start cleaning, the first thing to do is to read and follow the manufacturer’s cleaning instructions for your stove. You also need to get the extra components out of the way by disconnecting the fuel canister, fuel line, and the burner. Fill a bucket with warm water and add a few drops of dishwashing soap. You can also use a home cleaner. 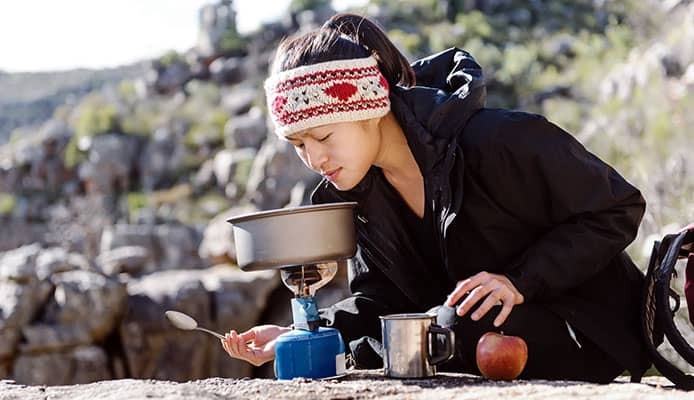 Dip a cloth or sponge in the soapy water and carefully but firmly wipe down all the components of your backpacking stove to remove grease build-up and food particles. Ensure no soapy water leaks into the interior of the stove. Being the dirtiest part of your stove with the worst grease build up, the burner will need more attention. Dip a sponge in the soapy water and scrub it firmly. You can also pressure clean it using a power washer. Rinse all the components and ensure your stove is dry before storing it. Leave it out in the sun to dry or thoroughly dry all of the stove components using dish towels. If you used a power washer to clean the burner, turn it upside down to let all the water drain out. Whether you’re exploring the backcountry or crossing borders, having a reliable backpacking stove will improve your trips. There’s nothing like the comfort of a warm, hearty meal outdoors or freshly brewed hot coffee to warm you up after a night in a tent. There are plenty of great backpacking stoves on the market. Whether you want the best lightweight backpacking stoves for hiking long distances, an integrated setup that boils water fast, a stove that will work in extremely cold situations and higher elevations, or the ability to prepare a gourmet meal to enjoy with friends, there’s a stove for you. Once you’ve found your best backpacking stove, practice using it in your backyard before you take it with you on the trail. This way, you’ll figure out its quirks and there will be no surprises. Happy trails! Which of the backpacking stoves on our list is your top choice? We would love to read your thoughts or experience with the stoves we’ve reviewed! Feel free to share in the comment box below!